Can you believe that the U.S. Presidential election is less than 4 weeks away? If you’re like most Americans, you’re probably not super thrilled with the way the election is going. I have some strong opinions when it comes to politics, but this post is not meant to be political. I’m definitely not going to try to convince you how you should vote. I made this lap book to be as non-partisan as possible. 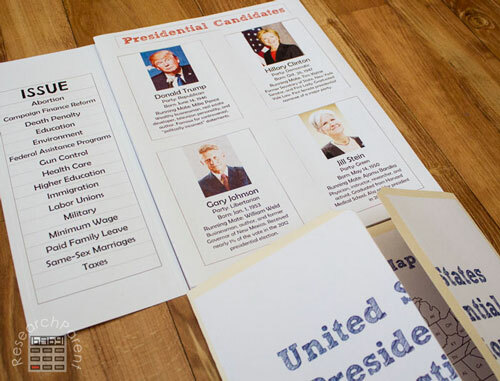 This free printable lapbook can be used for any United States presidential election, but there are also specific pages devoted to the 2016 candidates. There are 2 versions of many of the sections. One version has the “answers” filled in for minimal writing. 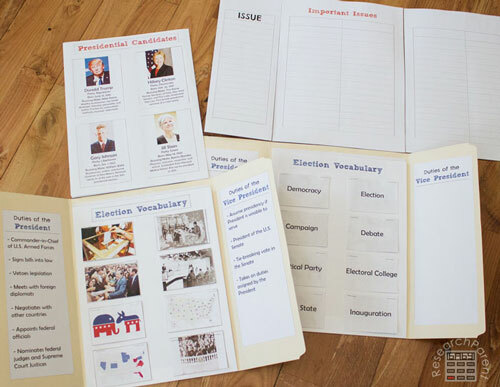 The other leaves sections blank so that the students can search for and write in the answers, such as the duties of the president or the candidates’ positions on issues. 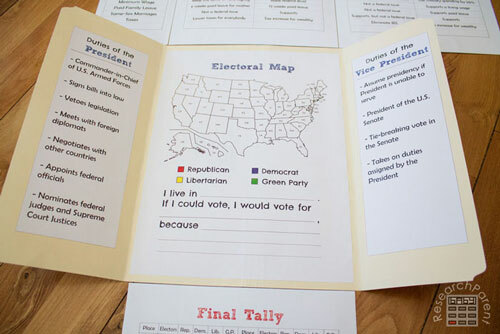 Both choices feature a blank map for students to color in states on election day. 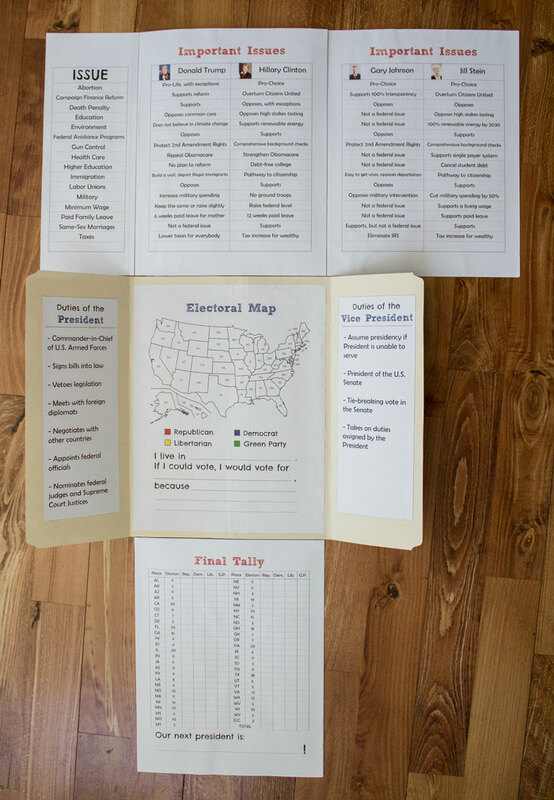 There is also a “Final Tally” page where students can keep score of the electoral college votes after a winner is declared in each state. 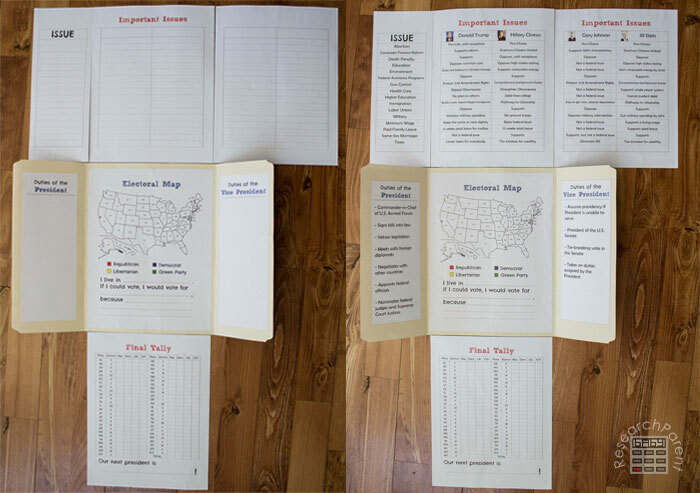 Print the United States Presidential Election Lap Book. Note that you will definitely not need the last 2 pages and may not need all the other pages as there are multiple versions of some of the sections. Tip: Make sure you apply the tape to the back when each page is folded, not open, otherwise you won’t be able to close it. The upper section is made of 3 pieces of cardstock (1 half sheet and 2 full size sheets). To attach the cover, place it where you would like on top of the closed folder. Hold it in place while allowing the left flap to move to the top. Trace the “seam” with a pencil. Cut it out then glue each section as shown. 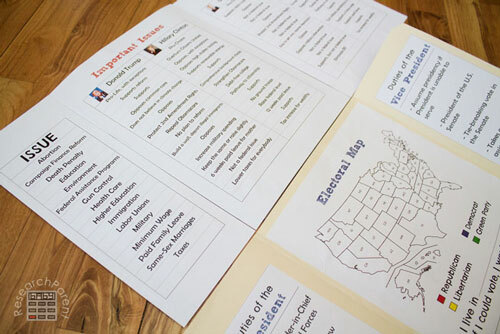 In the middle section of the folder, glue the Electoral Map. As winners are predicted for different states, color in the state with the appropriate color. In case you cannot print in color, I also included a page with the boxes empty so you can fill in the colors yourself. 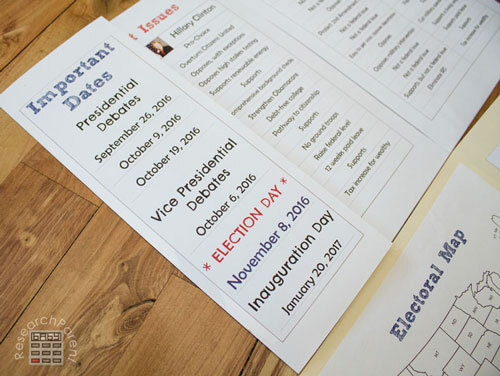 On the left and right sides of the folder, glue the Duties of the President and Duties of the Vice President. Note that there are 2 versions of these sections. One is empty for older kids who can look for the answer and fill it in themselves. One has my version of the answer. On the bottom piece of cardstock, when it is folded down, glue the Final Tally. 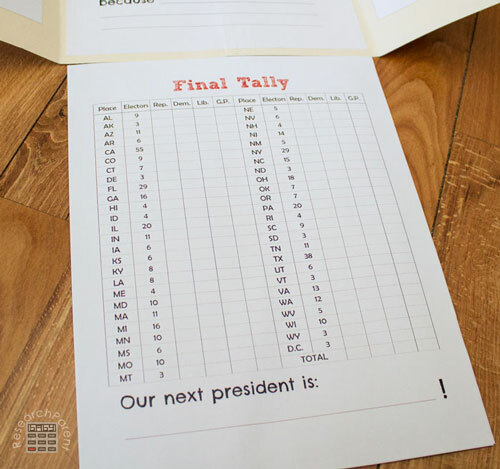 On election day, as winners are predicted, write the number of electoral votes into the winner’s column for each state. In this table, Rep. stands for Republican, Dem. stands for Democrat, Lib. stands for Libertarian, and G.P. stands for Green Party. 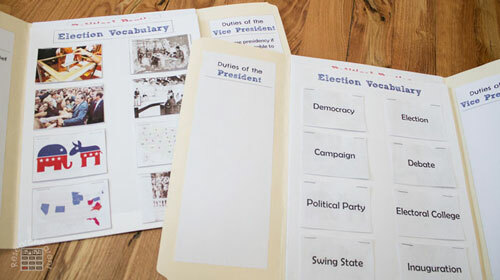 When you fold up the bottom piece of cardstock, this is where I included the election vocabulary. Each word contains a card with the term, a picture, and a definition. Staple the 3 pieces together in the order you choose and glue them onto your book as shown. I did it 2 different ways. In one of my books, I left the word on top, so that the child can try to think of the definition. In another, I put the picture on top, followed by the definition, so the child could try and think of the vocabulary word. When I talk about this section with my child, I’m planning to use a highlighter and let him highlight the issues that are most important to him and the candidate (or candidates) which have views that align with his. In this way, he can decide who he, hypothetically, would vote for. When you fold in the left hand half-page, this is where I included the Important Dates. When you fold in the right full size page, this is where I included the Presidential Candidates. 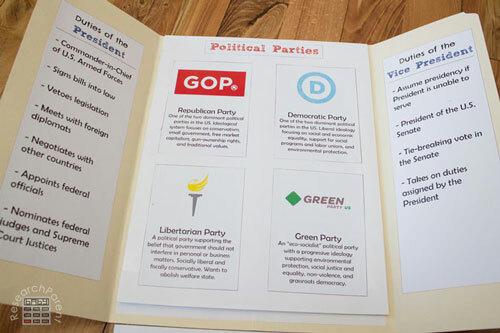 When you fold down the whole top section, this is where I included the Political Parties. No matter the outcome of this presidential election, I hope you take advantage of this once-in-4-years opportunity to learn about the presidential election process. 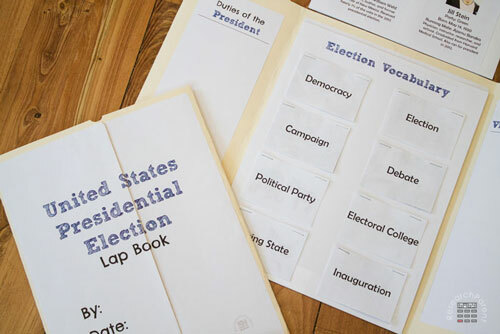 Make the most of election day with this free, printable interactive learning tool! 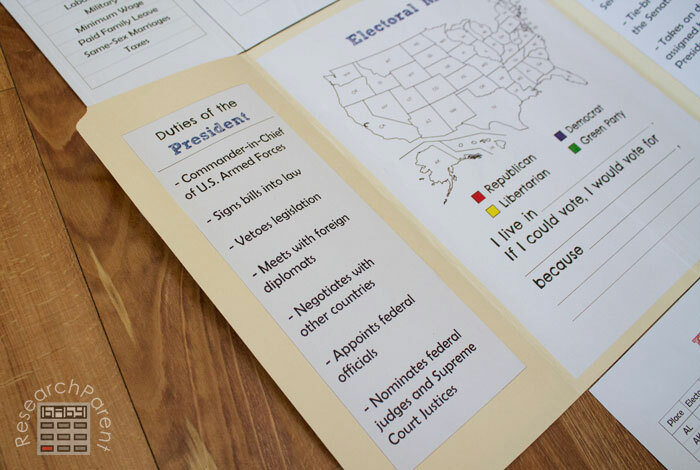 Click here for more Government and Civics activities and printables for kids. This is so very well done! Thank you for sharing this!!!!! Aww, thank you so much, Linda! You’re very welcome. Thank you so much for the lapbook! 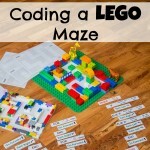 Especially the fact that I can use it for my elementary & middle school kiddos! Thank you so much! 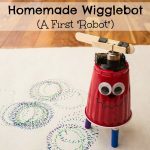 My DD loved it! 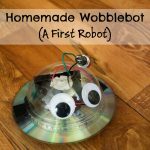 I shared on several homeschool pages!??? ?